The United Nations Development Programme (UNDP), the United Nations' (UN) global development network, is the largest multilateral source of development assistance in the world. The UNDP is an executive board within the United Nations Economic and Social Council. The UN General Assembly and the UN Economic and Social Council establish the overall policies that govern the UNDP. Headquartered in New York City, the UNDP is funded entirely by voluntary contributions from UN member nations. The organization has country offices in 166 countries, where it works with local governments to meet development challenges and develop local capacity. Additionally, the UNDP works internationally to help countries achieve the Millennium Development Goals (MDGs). The focuses of UNDP are providing expert advice, training, and grant support to developing countries, with increasing emphasis on assistance to the least developed countries. To accomplish the MDGs and encourage global development, UNDP's priorities are poverty reduction, fighting the HIV/AIDS pandemic, democratic governance, energy and environment, and crisis prevention and recovery. UNDP also encourages the protection of human rights and the empowerment of women in all of its programs. UNDP publishes an annual Human Development Report to measure and analyze developmental progress. In addition to a global Report, UNDP publishes regional, national, and local Human Development Reports. Critics point to the UNDP's institutional weakness and inability to influence the World Bank and the International Monetary Fund, which are independent of the UN system to claim that it fails the world's poor. The UNDP has not been successful in tackling third world debt, protectionist policies and tariffs that hamper fair trade or corruption in the developing world that too often thwarts progress in poverty reduction. The UNDP was founded in 1965 by the UN General Assembly, to combine the Expanded Programme of Technical Assistance, created in 1949 and the United Nations Special Fund, created in 1958. 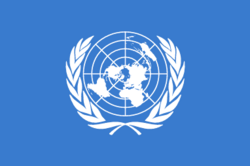 The two organizations were fully combined into the UNDP in 1971. In 2005, UNDP’s entire budget was approximately $4.44 billion. Of that total, core, unrestricted financing reached approximately $921 million. Noncore, earmarked contributions grew to over $2.5 billion, and resources to support countries’ own development programs totaled $1.02 billion. Spain became the largest single donor on December 2006, contributing $700 million (€528 million) to the Millennium Development Goals Fund. Before that, the United Kingdom was the largest single donor, contributing $254 million in regular and other resources, followed by the United States, which contributed $245 million to UNDP. Japan, Netherlands, Norway, Sweden, Canada, and Germany each contributed more than $100 million. The organization is a network and advocacy organization for global development. UNDP links and coordinates global and national efforts to achieve the Millennium Development Goals agreed upon by all member states in 2000, and the goals and national development priorities laid out by host countries. UNDP’s offices and staff are on the ground in 166 countries, working with governments and local communities to help them find solutions to global and national development challenges. Democratic governance UNDP supports national democratic transitions by providing policy advice and technical support, improving institutional and individual capacity within countries, educating populations about and advocating for democratic reforms, promoting negotiation and dialogue, and sharing successful experiences from other countries and locations. UNDP also supports existing democratic institutions by increasing dialogue, enhancing national debate, and facilitating consensus on national governance programs. Poverty reduction UNDP helps countries develop strategies to combat poverty by expanding access to economic opportunities and resources, linking poverty programs with countries’ larger goals and policies, and ensuring a greater voice for the poor. UNDP also works at the macro level to reform trade, encourage debt relief and foreign investment, and ensure that the poorest of the poor benefit from globalization. An example of a successful UNDP project is a coffee growing project that was instigated by Women's Federation for World Peace in Uganda with a $50,000 grant from UNDP. Approximately 400 families had been relocated from federal land and were barely subsisting on rocky, mountainous land. The project funds provided these families coffee plants. Volunteers provided education about crop care and rotation, water technology, hygiene and more. Family incomes rose from less than $400 US a year to approximately $1,500 a year. Crisis prevention and recovery UNDP works to reduce the risk of armed conflicts or disasters, and promote early recovery after crises have occurred. UNDP works through its country offices to support local government in needs assessment, capacity development, coordinated planning, and policy and standard setting. Examples of UNDP risk reduction programs include efforts to control small arms proliferation, strategies to reduce the impact of natural disasters, and programs to encourage use of diplomacy and prevent violence. Recovery programs include disarmament, demobilization and reintegration of ex-combatants, efforts to remove landmines, programs to reintegrate displaced persons, restoration of basic services, and transitional justice systems for countries recovering from warfare. Energy and environment As the poor are disproportionately affected by environmental degradation and lack of access to clean, affordable energy services, UNDP seeks to address environmental issues in order to improve developing countries’ abilities to develop sustainably. UNDP works with countries to strengthen their capacity to address global environmental issues by providing innovative policy advice and linking partners through environmentally sensitive development projects that help poor people build sustainable livelihoods. UNDP’s environmental strategy focuses on effective water governance, access to sustainable energy services, sustainable land management to combat desertification and land degradation, conservation and sustainable use of biodiversity, and policies to control emissions of harmful pollutants and ozone-depleting substances. Since 1990, the UNDP has annually published the Human Development Report, based on the Human Development Index. The focus of the Human Development Report is providing new measurement tools for development, a forum for global debate on key development issues and innovative analysis. UNDP invites independent experts to write the report by gathering input from a global network of academicians, and leaders in government and civil society whose responsibility is to contribute data on development indicators, best practices and ideas. UNDP plays a significant coordination role for the UN’s activities in the field of development. This is mainly executed through its leadership of the UN Development Group and through the Resident Coordinator System. In mid 2006, as first reported by Inner City Press and then by The New Vision UNDP halted its disarmament programs in the Karamoja region of Uganda in response to human rights abuses in the parallel forcible disarmament programs carried out by the Uganda People's Defense Force. The UNDG develops policies and procedures that allow member agencies to work together and analyze country issues, plan support strategies, implement support programs, monitor results and advocate for change. These initiatives increase UN impact in helping countries achieve the Millennium Development Goals (MDGs), including poverty reduction. Over 25 UN agencies are members of the UNDG. The Executive Committee consists of the four "founding members": UNICEF, UNFPA, WFP and UNDP. The Office of the High Commissioner for Human Rights is an ex-officio member of the Executive Committee. At the beginning of 2007, Secretary General Ban Ki Moon announced a goal of further unifying UN delivery systems at the country level in his report about UN System-wide coherence. In fact, Secretary General Ban Ki Moon recommends a single UN delivery system in each country to minimize duplication of administrative activity and efforts in order to maximize achievement of the Millennium Development Goals. The current Resident Coordinator for UNDP is Stojance Kitanoski. He coordinates all organizations of the United Nations system involved in operational activities for development in the field. The RC system aims to bring together the different UN agencies to improve the efficiency and effectiveness of operational activities at the country level. Resident Coordinators, who are funded, appointed and managed by UNDP, lead UN country teams in more than 130 countries and are the designated representatives of the Secretary General for development operations. Working closely with national governments, Resident Coordinators and country teams advocate the interests and mandates of the UN, drawing on the support and guidance of the entire UN family. The UNDP Administrator has the diplomatic rank of an Under-Secretary-General and is is often referred to as the third highest-ranking official in the UN after the UN Secretary General and the Deputy Secretary General. It is the Secretary General who appoints the Administrator for a four year term. The General Assembly is responsible for confirming the appointment. In addition to his responsibilities as head and operations manager of UNDP, the Administrator is also the Chair of the UN Development Group. The Administrator is directly accountable to the UNDP Executive Board. ↑ Inner City Press, Inner City Press. Retrieved April 14, 2008. ↑ The New Vision, The New Vision. Retrieved April 14, 2008. ↑ Millenium Campaign: Faith Based Organizations, UN Millenium Campaign. Retrieved May 14, 2007. ↑ Global Poverty, National Council of Churches of Christ USA. Retrieved May 14, 2007. History of "United Nations Development Program"
This page was last modified on 7 January 2016, at 17:08.